DMV.com was created to help simplify your life by providing you with all the vehicle related information and Connecticut DMV services you may need, in one place. Quickly find information and services regarding driving records, vehicle registration, drivers license renewal, license plate renewal, getting a learners permit, and finding a Connecticut Department of Motor Vehicles approved traffic school. The Connecticut DMV requires a drivers license for all prospective motorists. Learn how to get a drivers license in CT.
Get your CT driving record without having to visit the DMV. Ordering Connecticut driving records online is the most convenient way to obtain them. The Connecticut DMV requires motorists to get car insurance before driving. Find low cost car insurance at our online car insurance center. Taking traffic school in CT may allow drivers to dismiss tickets and reduce insurance costs. Sign up for an online traffic school course today. Complete a CT DMV practice exam online before you take the knowledge test. Taking a driving practice test can help you to get your license. 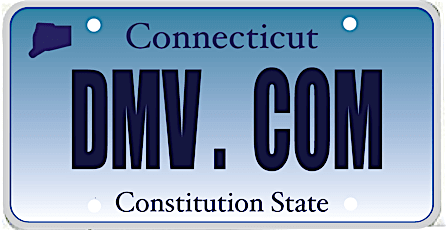 The CT DMV requires motor vehicle registration for cars owned by state residents. Learn about car registration services in Connecticut. Drivers ed classes are required by the Connecticut DMV for some new drivers. Learn more about drivers education in CT.
A Connecticut vehicle bill of sale is a receipt that shows a transfer of vehicle ownership. Learn how to get a bill of sale from the DMV. Learn how to fight speeding tickets and how to pay traffic fines online in CT. Drivers face DMV penalties for not responding to a ticket. A DUI conviction in Connecticut results in license suspension and other DMV penalties. Learn more about DUI laws in Connecticut. Buying a car online in Connecticut makes your DMV new car registration process simple. Purchase a car in CT using our helpful resources. You may need to visit a CT DMV office in person for some services. Find DMV locations in Connecticut to obtain the DMV services you need. You can avoid all DMV’s bureaucracy by checking out our web site. DMV.com is a handy and easy-to-use guide for drivers license, vehicle registration, license plate, emissions and other motor vehicle issues online. DMV.com is the best guide to the Connecticut Division of Motor Vehicles. If you need a fast way to discover the facts you need regarding the Connecticut DMV, you’re on the right place! As a privately owned website we’re not related to any government agency, so that means we’ve nothing to do with government bureaucracy. We just aim to provide you the facts you need when it comes to the Connecticut Department of Motor Vehicles, so you won’t waste any minute from your precious time. It’s completely irrelevant whether you own a car, motorcycle or boat because on our website you’ll find the most up-to-date info on driver’s license, auto insurance, registration renewal,etc. Our vast array of articles offers all kind of info, i.e., starting with requirements for getting your CT driver’s license to vehicle registration and auto insurance. You can engage with our site on our Facebook page as well. We encourage you dear readers to comment on our pages, and thus provide us feedback which will help us be even better.